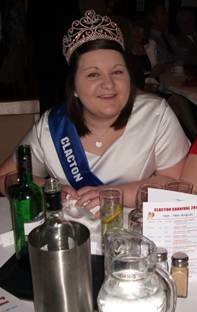 My name is Emma Rayment, I’m 18 years old and will be representing Clacton this year as your Queen! I am currently studying a National Diploma in music at Clacton Coastal Academy Sixth form. After sixth form I hope to go to university and get my degree in music so I am able to become a music teacher. When not at sixth form you would normally find me singing my heart out in my room, singing has been a big part of my life for many years and would love to perform on stage in the future. If I am not singing you would find me at Sainsbury’s which is where I work. Even though I haven’t worked there for very long all the staff and customers are lovely and I enjoy working there. Enough about me, time to talk about my two gorgeous princesses for 2012 who are Kerry-Alice and Zoe. After meeting them on Friday when we were chosen and then the following day when having our photographs done at the beach I can truly say they are really lovely and I am looking forward to getting to know them throughout the year. I think it is safe to say myself and my two princesses are looking forward to all the carnivals in the summer and of course Clacton carnival week (which fingers cross we have lovely weather this year!) That’s all for now but I hope you all come out and support Clacton Carnival and help raise money for some very good causes. I will keep you updated with all the events throughout the year myself, Kerry-Alice and Zoe attend. This was our first official event since being crowned Clacton Carnival Queen and Princesses 2012 and the nerves were starting to kick in. 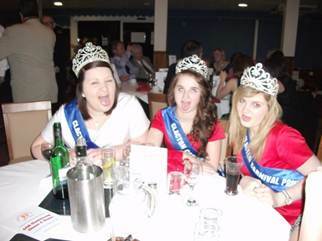 The selection night took place at The Maltings Academy on April 28th for the selection of the new Witham Carnival Court 2012. Because we had never been to an event like this before me, Kerry-Alice and Zoe didn’t know what to expect. Our chaperone Debbie and Jenine picked us up one by one and on the way we discussed what will happen during the night and we found out there was a competition that we could enter. For this competion would have to present ourselves to the judges and also do a curtsey. Me and the girls all looked at each other is worry because we had never done this before, but we decided we had nothing to lose and that we would enter. As we arrived at the Academy we did a run through how we would curtsey to the judges and present ourselves, we then realised that it weren’t too hard. We were greeted by the 2011 carnival princesses but unfortunlly the Queen wasn’t present and they showed us to our table and we got ourselves settled and ready for a photo opportunity. As more courts started to arrive we began to go introduce ourselves starting with Southend, Enfield, Burnham on crouch and Basildon. There were many contestants that had entered for queen and princesses and when they began to introduce themselves I had already decided who will be chosen. After busting a few moves on the dance floor with the girls and other carnival courts it came to the competition it that we decided to enter and as we stepped outside they were putting us in alphabetical order and we were near the front. Majority of the courts that were there had done this before, so they had experience but they were giving us a few tips what to do which was really nice of them as they didn’t have to. It came to Clacton go next and myself and my princesses were really nervous but as we stood in the middle of the room and introduced ourselves it wasn’t too bad, we gave big smiles to the judges and we were all happy how it went. As it came to the time of announcing the winners of the compition, unfortunately we didn’t win anything but it was a great experience to learn from and we congratulate the other courts that had won a prize. It was a big moment for Witham’s court to be announced and to my shock it was the three girls that I had chosen in the beginning. They all had big smiles on their faces and were really happy. Congratulations to Queen Darcie and Princesses Mia and Lauren. Myself, Kerry-Alice and Zoe all had a lovely night out and it was great to meet all the new courts and looking forward to getting to know them throughout the year. As Clacton Carnival is getting nearer events start to take place and the poster compition was one that was taking place. This was our first we got to wear our dresses, with our flowers, bag and also our crown. On the way there we were given the idea what would be happening and what our role would be during the presentation. When we arrived at St James Church hall, we were greeted by committee members including Laura Durrant who is the organiser of the event and also the Chairmen Paul Townend. We were asked to greet all winners and parents at the door and hand out carnival leaflets about events during carnival week. Once winners have all arrived we were asked to hand out the certificates and rosettes to the winners and there were quite a few of them. Each time a winner came up the chairmen got them to point at which poster they had designed. After each contestant had been rewarded with their prizes we then had a big poster with all the winners and also the chairmen in front of all the poster for the newspaper and also for parents to take. We also had some individual pictures done with some of the winners and their posters. The posters that we got to see were really bright and colourful and were based round all different events that are happening during carnival week. Myself and my princesses would like to congratulate all the winners that night and all the entrants as they all did a fantastic job and that they should be proud of themselves. Well Done!! Also a thank you to Laura who organised the event and to the judges, who had the hard task of judging all these wonderful posters, must have been a hard job to choose all those winners. All we have to do now is wait and see which poster gets picked to be the front page for the carnival newspaper. So it’s the morning of our first carnival and I’m up bright and early ready for a fun day out with my princesses. On arrival, we were greeted by Brightlingsea’s Carnival court who told us about the plan of the day and how there have been as few changes as well. Myself and brightlinsea’s queen spoke about how the weather was holding off for them and how they are excited for their carnival. Even though it wasn’t raining it was so windy and a bit cold. Before going over to our float we sat in the car keeping ourselves warm before judging and it was the perfect moment to give Kerry-Alice and Zoe their presents. I had got them some jewellery made which I had one made similar to them to wear with their dresses. They were really happy with them and were so thankful for the present. It made me really happy that they liked them and also wearing them as well. So it was time for judging, nerves started to kick in but we still smiled and stayed calm. A few of the judges came over to us and we chatted about how the weather, our dresses and also about our carnival. They were so polite and commented on how beautiful we all looked. But unfortunately we hadn’t won anything, which was a shame but congratulations to the others courts that did. By this time all our families were starting to turn up and was a perfect time for a photo opportunity. This was the hardest thing to do with the wind, all of us girls were having with our hair it was going all over the place but we managed to get a few perfect ones. Now it’s time to move off for the processions, as we set all it was big waves to the members of the community that had turned up and even a few people curtsied at us. Made me smiled and laugh, they were so sweet. Once we had made it back to the carnival field we were taken to the arena so that all the courts were together to be introduced to the audience that were awaiting our arrival. We then went onto the Brightlingsea Bowls Club and had our Queens Tea which was delicious and we were able to chat away with all the courts that attended, also to catch up with some friends that we had made at Witham Selection Night. The brightlingsea Queen made a lovely speech about the day and thanked everyone who attended and each court that was there one by one thanked Brighlingsea court for inviting us. We then said our goodbyes to everyone and made our way around the fete with our chaperons to see what they had on offer. We even got to see an owl that was in harry potter I was so happy, we were offered to have pictures but as we were in our dresses it wasn’t a good idea and then we made our way back to the car for our journey home. A big thank you to Debbie and Kerry who were our chaperones for the day and also to Debbie and Jenine who set up the float and toed us in the carnival procession. Also a thank you to mine, Kerry-Alice’s and Zoe’s family who came and supported us today. 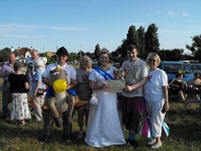 We had such a lovely day and are looking forward to Great Bentley carnival on the 30th June 2012. It was the morning of our 2nd carnival and the weather was beautiful outside and I knew it was going to be a lovely day. As Nicky and Debbie picked us up, me and my two princesses had a gossip on our way to Great Bentley as we hadn’t seen each other for a while. And by the time we had finished chatting we had got there. As we arrived we were greeted by Brightlingsea court and caught up with them and by this time other courts started to arrive and we had formed a big circle of girls gossiping away. We then were greeted by Great Bentley court and they discussed with us how the day was going to work and what there will be after the procession and the Queens tea. As time went by it was time for judging so me and the girls went over to the float and prepared ourselves. Even thought we knew what to expect from our first carnival we were still nervous but we had big smiles and presented ourselves to the judges. Unfortunately we didn’t win anything but we were just happy we were having such beautiful weather. It was time for the procession to start as all the carnival court floats lined up, music was playing and the sound of the public was being heard i was excited. The procession was paraded throughout the town and we were brought up to the arena at the end so that we could be presented and then meet with all the other courts and also to find out who had won prizes for floats, majorettes and bands. Once all awards had been handed out we were allowed to go and have a look round the fete and then meet back for Queens’s tea. Me and the princesses were a bit peckish and we found the cake stall so we went and sat down and had a cupcake each. They were amazing! I had to have the chocolate one! Once we had looked round it was time for the tea and we sat down with all the courts and enjoyed the gossip and a lovely spread. We were really lucky to have such beautiful weather and we all had such a lovely time and a big thank you to Debbie and Nicky for looking after us that day. So it was the morning of Holland havens summer fete and I was quite nervous about the day as I didn’t know what to expect and neither did Kerry-Alice and Zoe. The sun was shining and it started to get hot before we had arrived. As we all got picked up one by one we had arrived and we told what would be happening and how we were going to be involved. I was told I would have to open up the fete with a small speech by the gates. By this time I was nervous!! As we wondered round and looked at the stalls and we found some lovely bracelets which had been handmade. As got closer to opening time we had a few pictures done for the school and also by our chaperones, it was now time to open up. I was handed over a microphone and everyone was looking at me. I started to go red. But I announced that the fete was open and to help raise money for the school. I was pleased for the school as they had lovely weather and hope they raised a lot of money and a big thank you for inviting us. We had a lovely day. So as i looked out my window the heavens had opened and it was pouring down, I felt so bad for the Witham court as it their first event for 2012 court. But as Debbie and Paul picked us up we were still determined to go and support them. As we arrived at the football club we went and sat inside so we were all dry and joined Burnham-on-crouch court and had lunch. By the time we had finished eating all the courts had started to arrive so we were all catching up since we last saw each other. There were some new faces that we had never met before such as Hornsey, Tiptree, Great Dunmow, Mersea Island and Enfield but they were so welcoming and lovely. Because of the awful weather the judging took place in the hall and the judges came to each court one by one and spoke to us. The mayor was lovely he spoke about when he used to come to Clacton and asked about our charities and how we have a whole week of carnival events unlike others. It then came to the announcement of who won Queen of Queens it was Basildon and Pitsea court, it was a shame I didn’t win but well done to their queen. It was now time for the procession and it had stop raining and they started to line us up. And as we moved off the rain started to appear again so it was umbrellas up for us girls to keep us dry. It wasn’t till we got into the town there were more people and they were so friendly they gave us big smiles and loads of waves. Especially all the children even a few adults. We got to the end and we met up with all the courts and with a marching band in front of us they walked us through to the arena and called us in one by one. Where they announced the winners for marching band and majorettes. Then which we stood to do the national anthem which was something new to me. We then had to walk to the Town hall for queens tea which we all joined in together to wish the Witham carnival princess Mia happy birthday which was so sweet. After tea each court done a small speech to say thank you and even though the weather wasn’t as good we had a lovely day. It was then time for Myself, Kerry-Alice and Zoe to make our way home, so we tried to get to every court to say goodbye and each of them had said that we would see them at our carnival on the 18th august which we were happy about and we then went up to Witham’s court to wish them luck for the year and thank them for a lovely day. A big thank you to Paul and Debbie for being our chaperones for the day and also to Debbie Davey and Jenine for bringing the float and toeing us despite the weather. So it’s the first event of carnival and nerves have started to kick in. This year’s carnival week started off with Donkey Derby due to the Olympics. It was only myself and Kerry-Alice tonight, due to Zoe celebrating her birthday we hope she has a lovely night and you will be missed. On arrival we were explained what we will be doing tonight and how we will be involved in tonight’s event. It was time for the first race to begin. I was holding the union flag in the air ready for the word “go.” And then the race was off, all you could see was the riders holding on tightly and fighting to win. They all looked so nervous but at the same time having a lot of fun. Each winner of the races received a rosette and a prize which was the Olympic mascots. As the evening went by more people had started to arrive and the weather started to play up. It began to rain but that wouldn’t stop everyone have fun and betting on the races. 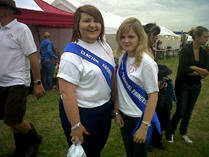 Me and Kerry-Alice took turns on starting the races and it came to my last race it was the daddy’s race. The dads weren’t using real donkeys but wooden horses instead so it was much easier for them and more entertaining for us. After the word go I waved the flag and the race was off, there was so much laughter amongst the crowds and it was something different to add to the night. Congratulations to the dad that won you deserved it! He evening had came to the end and was time for us to go home. Well done to all the winning jockeys, the public for coming out to support us and the committee for their hard work to make tonight successful. Myself and Kerry-Alice had such a lovely and funny night. We will see you all at our new Tenpin bowling tournament tomorrow night. So tonight’s the new event down at the Pavilion bowl for our bowling tournament, I was really excited for this event as it new carnival week and we didn’t know what was in store for us. As we arrived down at the pavilion bowl we had the perfect opportunity to take a few photos before everyone turned up. Unfortunately tonight we wouldn’t be bowling but we will still be watching all the teams bowl and decide which team we will cheer on. This was quite hard as there were 2 carnival committee teams so we had cheer both of them on. We luckily enough were having a lovely meal in the new Armstrong restaurant with our chaperone Debbie. After we all had enjoyed our lovely meal it was time for desert it didn’t take us that long to decide on what we wanted it was defiantly double chocolate brownie with ice cream and chocolate sauce. Mmmmmm……. Delicious might I add!! After our lovely meal it was time to announce the raffle and also announce the winners and the runner ups. The runner ups were presented with silver medals and the then it was time to announce the winner for first, they were presented with a gold medal each and I also presented them with a shield as well. This then gave us an opportunity to take photos with all the winners. Well done to everyone who took part for the first ever Clacton Carnival Tenpin bowling tournament. A big thank you to Pavilion Bowl for the sponsor of the event and also to the committee who helped to make tonight a lot of fun. See you all at the sand castle competition, egg throw and beer dig! We were quite lucky the weather was on our side today, it was cold but it wasn’t raining. As children started to arrive for the sand castle competition they had to sign into their categories which ranged from under 6, 7-9, 10-14 and pairs. This had been the first time I’ve been to the sand castle competition so I was excited to see how it worked. The time limit that they had to build their sand castles was an hour and as we watched from above the beach it was so exciting seeing all these children creative sides. Time was passing by and all these different sand castles were being built, it gave me, Zoe and Kerry-Alice and chance to quickly go off and have a cheeky ice cream. And by the time we made it back it was judging time. Debbie and Kerry-Alice did the pairs and 10-14s and me and Zoe did the under 6 and 7-9’s. This was the most difficult decision to decide on and me and Zoe were finding it hard. So Susan had organised a hoola hoop competition so while everyone was joining in we tried to face the difficult task of choosing some winners. As we had verified our decision with our partners and headed back up to the lower prom we watched the chairmen Paul show us how to hoola hoop it was great laughter. Each person who took part was given some sweets each and the winner was kept on for the final round. And as we lined up all the winners I was asked to judge to see who would be the last one standing. It came to the final three and I had to decide on two winners who used different techniques to keep going. Both of the winners were given a big packet of sweets each. After competition the winners of the sandcastle competition was announced, in each age group there was a Bronze, Silver or a Gold medal winner and they stood on boxes to represent they had won. All the sand Castles were amazing and all very different. We hope everyone had a fun day and we will see you later for the beer dig and egg throw. We were so lucky for tonight’s events, it had rained at least an hour before it had to start I was worrying they may have to cancel because of the weather. But it blew over, thank god! These events are always full of laughter and are for any age to join in. It was a bit chilly, but we didn’t mind that! We started selling raffle tickets to the public who had turned up while they were all getting ready to take part in the egg throw. By this time the first race had begun and the way people caught them had people in stitches. Me and Zoe looked at each other and thought let’s do this, we can beat them. Well wasn’t that a shocker as I threw the egg to Zoe it just broke in her hands, I couldn’t help myself and I just had to laugh. I then had another go with Kerry-Alice and that ended badly as well, I think everyone was in shock that we couldn’t catch. But it was great fun. There was a good few rounds of the egg throwing and it then came to the final and two men had won the prize. They both did so well and looked like they had a lot of fun. As the committee started to prepare the tokens by placing them in the sand, the public started to lining up to around ready to start. And they were off; everyone was determined to find a token. They all liked they were enjoying themselves! The special prize was found by a young girl and she was so happy. Well done tonight to everyone who took part and well done to all the committee once again it was a successful night. See you all at the fete and fireworks. Tonight was such a lovely night; we had amazing weather this year! It was really warm when we had arrived and compared to last year we took full advantage of this and wore our dresses. At the start of the evening we were selling raffle tickets and also advertising the wrist bands incase your child went missing. So we had our wrist bands on as well. So was so nice to see how many people started to turn up as we were selling them. They all greeted us and even bought the raffle tickets. We even got the opportunity to take a photo with a really cute baby. As it got darker we were allowed to go off and have a look at the stalls or in Zoe and Kerry-Alice case get a burger. Which did look nice but I opted out and had donuts instead. Then the first firework went off, so I took my seat next to the princesses and watched such an amazing display. They were the best fireworks I had seen for such a long time. They even had Olympics rings which were really good. After the fireworks had ended it was time to announce the winners of the grand raffle. I picked out 1st prize which was £100, Zoe picked out 2nd which was £50 and Kerry-Alice picked out 3rd which was £25. Well done to the 3 winners. I enjoyed myself loads tonight and so did the girls. Thank you to everyone who turned up and supported to tonight’s event. Also thank you to the committee who stayed behind after tonight’s event to pack away all the games and everything off the field. See you all at the children’s fancy dress and the quiz night! As Clacton street procession is only 24 hours away this was a great time to get an insight to what everyone ideas were for the theme for this year’s Clacton Carnival street procession which is Going for Gold. We were quite lucky that this was a late start for us as we did have a late night at the fete and fireworks. I was particularly excited to see all the children and their costumes. We were all picked up one by one and were taken to St James Hall and were greeted by Brenda the organizer and the committee member, which then Brenda explained to us what our role would be today. We were then introduced to the judges and got the chance to have a chat about carnival week so far and also about the big procession tomorrow. By this time entries had started to arrive and wow they were amazing. So many different ideas and a lot of them were sticking to the theme! Each age group was called out under 5, 5 to 7 and 8-11, also there were categories for theme and pairs. This was going to be a hard task for the judges as they were all so good. We were asked to parade all the children around to show everyone their costume and also give some time for the judges to decide. In the pairs categories there was two super babies and they had came as pebbles and bam bam, I could of taken them home they were that cute. I was so glad we didn’t have to do the judging. After each category myself and the princesses were required to sell some raffle tickets for a small raffle before they announce the winners. While the judges were making their final decision and the committee members were sorting out the rosettes and gift we had a guest surprise it was Elvis. All the children were having fun and a little dance off as well. It was time to announce the winners, each category had a 1st, 2nd, 3rd and commended. They had received a voucher for rascals play centre and a medal. It was great to see all the lovely costumes and the children so happy. Myself and the princesses even got an edible biscuit medal as well. It was lovely!!! Normally this would be the last night for Carnival week but this year it was different, as me and the girls got picked up we spoke about how excited we were for tomorrow big carnival street procession. We couldn’t wait to look all glamorous and see all the funky floats, bands and visiting queens. This would be last night we would sell raffle tickets and I was happy about that! Hahaha!! :D As we made it around the tables the names they all had chosen were fantastic, but I couldn’t help but love my family’s one. The Queens Mother how ironic! But it was defiantly a good one I must say! It was time to start the first round and the quiz master had come up with some really good questions! After each round myself, Zoe, Kerry-Alice and the help of my lovely brother Jamie had to go collect the answer sheets and any jokers that the teams wanted to enter. Between each round me and girls found the time to munch loads of sweets and nibbles, which we did manage to demolish by the finish. It came to an interval and we carried on finishing selling raffle tickets hoping we can make some more money to go towards the charities we have chosen this year! It came to the time were all the rounds had finished and the winners were being announce. Each winner received a prize each and of course a picture with the carnival queen and her princesses. But the most shocking moment of the night my family had won the booby prize. I was in so much laughter and as my brother came down to collect their prize all I could hear was my family cheering. It was so embarrassing and they didn’t even share the jaffer cakes either L The chairmen Paul came up and said a few words about how tonight has gone really well and how much we raised. And also mentioned Adrian’s amazing talent and I presented him with his gift from us. Then Paul presented me, Zoe and Kerry-Alice with a cheque each for being this year’s Clacton Carnival Court! It was now time for us to go home and have some beauty sleep for tomorrow’s big event. See you all tomorrow!!! So today’s the day and nerves started to kick in while I was having my hair done. I was so lucky that my Nan was a hair dresser and that she offered to do my hair for me and what a lovely job she did. Once I put my dress on, I was ready to go! But had to wait to be picked up first! I was so impenitent today, I think it was because I’ve waited years for this moment to happen and it was finally my year to be queen! As we arrive at west road car park, I could see so many floats already and a few carnival courts as well. While we were waiting for people to arrive it gave us an opportunity to have some photos done for the local gazette and some photos done with all the carnival courts, so that I could put them in my scrap book of my year as queen! But then the Sainsbury float had arrived, I was so happy to see it as I work there and couldn’t be on the float! I managed to get away and see all my co workers and have a photo with them. I loved the float! At 5.15 pm, the judging had begun and me and the princesses stayed were the trophies were for when the winners had been announced. As each winners came up one by one. I saw one of my supervisors headed towards me, we had won 1st place I was so happy for them, they defiantly deserved it! As the trophies started to disappear it was queen of queens and queens float left and I was quite nervous about this one as I’ve got to know all these girls so well and they all deserved it but we could only have one winner. 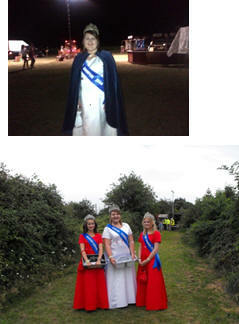 Queen of queens was awarded to Witham queen Darcy and Queens float to Walton on the naze. Well done to all the winners and even if you didn’t win, you all looked fantastic. So it was time to move off I was so nervous but excited at the same time, we had a fantastic band behind us throughout the street procession and as the countdown begun it was time to begin. As we started off the procession, everyone was giving us big smiles and children were waving. And this made it so much more exciting to see the reaction. As we headed towards the moon and starfish, I became more nervous it was so busy but it wasn’t as bad I thought but we managed to get past there in one bit! It was the end of the procession for me and my princesses and even though I was still in excitement I was in shock knowing that this year carnival had come to an end for us. Once arrived at St Paul’s church for queen’s tea we awaited all the visiting courts and then it was time for my speech. I spoke about how this year has been amazing and that I’ve met some amazing people, the laughter I’ve had with my princesses and thank you to Debbie, Nicky and all the committee for their hard work this year. 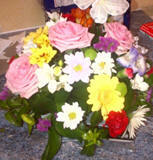 Also thanking the Inner wheel ladies for the lovely tea and gifts. Today has truly been an amazing day and I’ve had such a wonderful time being queen! I can’t believe how quick time has gone. Thank you to everyone for their support this and thank you to my princesses for such a fantastic year. Bring on Walton Carnival!! Omg!!! This is our last every carnival as this year’s court as I was quite excited and sad about it! 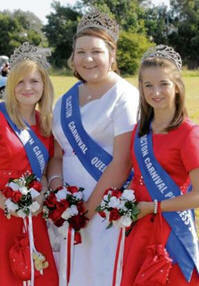 I can’t believe this would be the last time I will be waving to the public as Clacton Carnival Queen. But we were going to make this an unforgettable day and we did! As we arrived the weather was holding off and we got some time to eat our lunch. But as soon as we sat on our float the heavens opened. I was so dishearten as I thought because how bad the weather was we might be going home. But no we were going to carry on! As the rains stopped we were able to take a few photos but it didn’t stop for long. The rain was so bad the umbrellas weren’t protecting us. 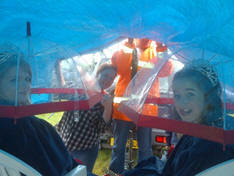 But our driver Debbie had such a fantastic idea; we used the cover for the float to keep us dry. So as we sat on the float for the cover on us, we had some laughter and even some funny photo. This was defiantly going to be a carnival to remember. I thought we should won a prize for being so dedicated! Finally the rain had stopped and they began to do the judging. The Walton Carnival Queen Sarah came over and spoke to me and the girls about our year as queen and then went around and spoke to the other carnival courts. And then it was time for them to announce the winners. I came 3rd for Queen of Queens. Yayyyyy!!!!! I was so happy with this! This was the first time we had won a p rize and we were lucky it was at our last carnival of the year. As the procession moved off the sky brightened up and the crowds started to appear. It was a lovely procession and we enjoyed it so much. At the queen’s tea, Sarah did a lovely speech and presented gifts out to the committee, which then we sang happy birthday to her as it was her birthday the following week after. Each carnival Queen was present with flowers that were on our table with a stick of rock. Today has truly been one of the most memorable carnivals we have been throughout the year. We have had so much laughter today with everyone and it was good to see all the carnival courts before they all finish their reign. This is a very special event for Clacton carnival and I was honoured to be part of it with my princesses Zoe and Kerry-Alice. Clacton carnival held a dinner and dance event to celebrate 60 years of carnival with friends, committee members and ex committee. The evening started off with talking to old friends, charities that have been involved in the past years and of course the carnival court. As we sat down which on our table we had the Chairman so it was best behaviour for us girls. We all talked about the past year and how much fun we had during our reign and how I don’t want to give my crown up next month. Our starters had arrived and I had chosen the soup. Wasn’t a good idea really for me seeing as I’m wearing a white dress but I managed to not spill it on me! Thank god otherwise I might have been in trouble. Then our main meal came out, I had the roast beef, with loads of gravy and don’t forget the carrots. Which I did eat all of them! And as Paul our chairman said “We will defiantly not lose you later” Well now it was time for deserts me and the girls looked at each other and tried to decide what we wanted! But it was such a hard task for us. Me and Kerry-Alice went for the lemon meringue and Zoe had Ice-cream. They were delicious and would like to thank the chef for our lovely meal. After a short break it was time for the speeches. Alan Wiggins was first up and spoke about all the different events that have happened throughout the years at carnival. Some new and some old. And how they were great memories. He spoke about how the carnival court use to be much bigger than what it is now and how it’s all changed. 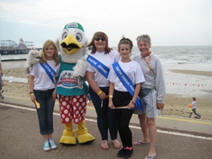 It was clear that everyone in the room had great memories of Clacton carnival and they would live on for years! Mine defiantly will as I’ve shared it with two great girls. We then had Sharon Alexander talk about her memories and how she’s been involved with carnival for many years. And it was great to see how carnival has modernised throughout the years from what she was saying. All of the great memories everyone spoke about was amazing. And like they carnival is like one big family and it really is! Once all the speeches were over we had a disco and everyone got involved. I even managed to get the princesses to dance for a bit. I even saw a few committee members to gangman style and that really made my night. It was time for us all to leave and we all said our goodbyes. This was a really lovely night and I was so proud to be part of it. I enjoyed everyone talking about the past 60 years and how committee members come and go, events changing, the charities involved and all the money they have raised over these years.